So, in the last few weeks, I’ve sold 2 guitars and, now, 1 amp. But, don’t worry, I haven’t stopped buying, it just wasn’t a Guild. 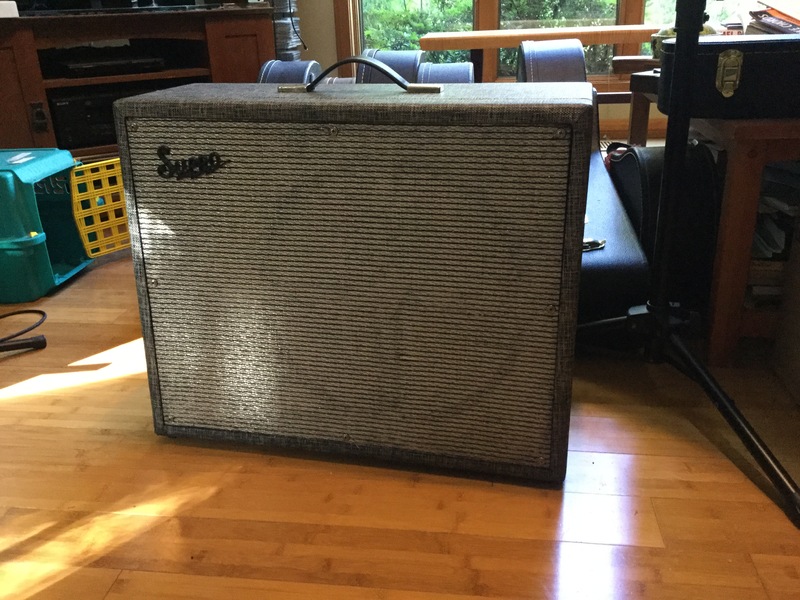 The latest acquisition to the all-too full stable of amps is a 1966 Supro Thunderbolt. There’s been lots of discussion and debate on whether a certain famous guitarist (initials jp) did, or did not, use this to record the first album(s) of a certain band (initials lz). To be honest, I really couldn’t care less. (If I did, I would now have a Custom Hiwatt DR103 full stack deafening the Appalachian region as we speak.) I just loved how these sounded. It’s a really simple circuit, but it pushes some monster tone through its 15” speaker. I think it has a pretty unique and attractive package, too! I like the '60s Valco amps a lot. Circuit-wise they mostly did their own thing. Easy to get a good sound going. JP has always been coy about which model Supro he used, but the Thunderbolt oughta get you in that ballpark. Last edited by Quantum Strummer; 09-06-2018 at 09:07 PM. Course, I wasn’t trying to get his sound. It’s just a great amp, period. I bet it was actually Mickie Most's amp and he just can't remember. Those amps are wonderful. I’ll bet it sounds glorious. Enjoy! Congrats - looks really clean! Or maybe Pete Townshend played all the Zep I guitar tracks. Through a Hiwatt.